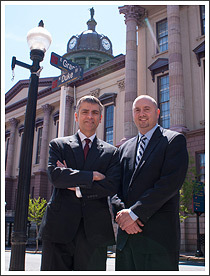 Based in the greater Lancaster area, the attorneys at Miller Lyden specialize in Criminal and Family Law services. We pride ourselves in guiding our clients and their loved ones through some of the most difficult situations in their life. Being charged with any serious offense is a frightening and life changing experience that requires a criminal defense attorney who knows the law. It is imperative that if accused, you know your rights under the law and do everything necessary to protect those rights immediately – before memories fade, evidence is lost, or witnesses disappear. Getting help quickly and having a capable criminal defense attorney on your side helps to ensure you get the absolute best defense possible. Likewise, family law matters, such as divorce and custody, present complex and sensitive legal issues. We understand the importance of these cases, where the outcome may have a long-lasting effect on a person’s life. We can guide you through the legal process and, when necessary, fight to ensure a fair resolution. The size of our organization is designed to ensure we are able to give each client personalized service. Our legal team will answer your phone calls personally, and they work shoulder-to-shoulder with each and every client at every scheduled hearing.